When students write information or argument texts, they make appropriate selections of information from a few sources and attempt to synthesize and organize these in a logical way. The student interprets and constructs multi modal texts. Students critically analyze and explain the socio-cultural values, attitudes and assumptions that texts reflect and project. Manipulates and synthesizes a wide variety of strategies for reading, viewing, critically interpreting and reflecting on texts with multiple levels of meaning. Students read, listen to, view and critically analyze complex texts. Students recognize that texts have points of view, even when these are not explicitly stated, and with teacher assistance identify and comment on them. Students analyze the ways texts are constructed to position readers, viewers and listeners. Students select appropriate strategies to critically analyze and interpret a range of complex texts, justifying their interpretations with substantial evidence; critically analyzing how text structure and conventions can influence a reader’s response. This resource is also relevant to Media Studies- Audiences, Representation, Media Conventions, the Documentary Genre and Media Production. 1. How many different modes of representation are used to present the story of Cuc Lam’s suitcase? Discuss the use of narrator to camera in the opening shots and the time compression sequence that follows taking us into the museum, the 1978 footage and the interview with Cuc Lam. 2. How does the video clip represent Cuc Lam’s journey? 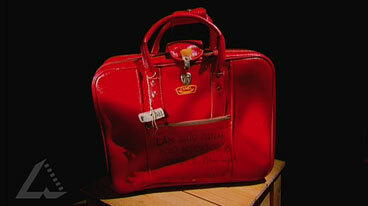 Discuss how the the images of the suitcase and its contents are framed. 3. Discuss the role of the music soundtrack in the video clip. What mood does it evoke? 4. What point of view are we as the audience invited to take about immigration? Write a brief list of words used by Warren Brown that position us in relation to immigration policies in 1978. 5. How is the suitcase represented as a symbol in the video clip? Discuss the actual suitcase, Warren Brown’s drawing and the language used to describe it. 1.Choose an object that has meaning for you in a cultural context. (For example, something you or your family may have brought with them to Australia in any era: a photograph, clothing, trunk, personal memorabilia, a treasured souvenir etc). Have show and tell in class to share insights about the objects and what they represent to the students. 2. Write an article about it for a newspaper or magazine or for publishing online; it could be a blog. Include interviews, photographs and other relevant material. 3. Produce a short DVD documentary about the object. Think about how you will present the object and what images, sound and narration and/or interviews need to be included. 4. Tape a radio program about the object. What needs to be considered when images cannot be included?